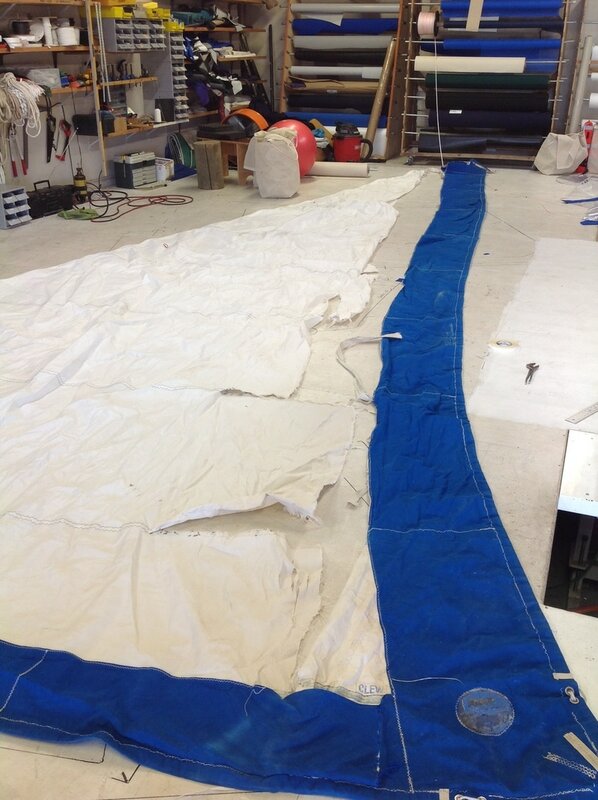 Some of the most common sail repairs and horror stories we receive have to do with roller furling jibs. They are a convenient solution to having to move around the deck under way packing and unpacking a sail, but from a sail makers perspective, the roller furler is a potentially hazardous solution. 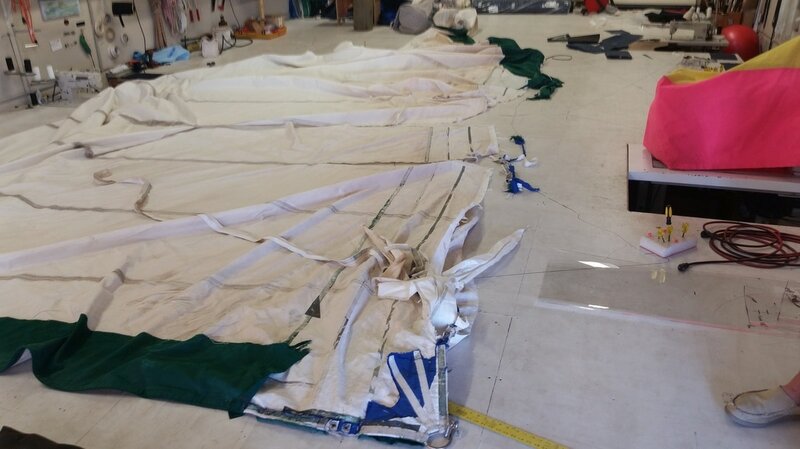 Most times, the sails are rarely handled and inspected because they almost never come down, so small problems and potential failures often go unnoticed until there is a complete blowout of the sail; possibly when you need it most. A few weeks ago, there was a powerful wind storm with gusts reaching up to 80 mph in some places. As a result we received lots of work from damaged sails, awnings, and a couple dodgers and bimini tops. The picture above is a roller furling jib that came off of a boat in Maalea harbor. The boat was actually in its slip in the harbor at the time of the storm but their jib wasn't rolled up tight enough and unfurled. In a matter of hours, the sail had completely flogged itself to shreds and destroyed the entire clew patch. 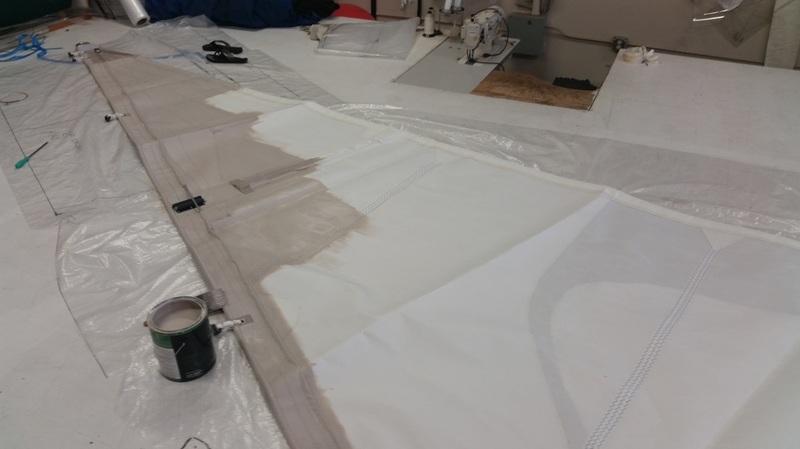 It may have been possible for us to repair the sail, but we estimated the time and materials it would take to recut and repair the sail may have covered the cost of simply buying another sail so we just recommended a yacht surplus business. The customer found the exact size and he had a nearly new sail on his doorstep within the week. Back in 1975, my dad created a wind funnel to fit in an open hatch with the purpose of ventilating his boat. All you have to do is hang it from a halyard and the vanes in it allow it to funnel air from any wind direction if you're at anchor. It worked so well, that other cruisers and yacht owners began asking where they can get one for themselves. He reproduced the simple invention and sold a hundred or so out of a magazine from a company called Sail Services in San Diego. Years passed and demand for the ventilator dissipated but this last year we had a particularly hot summer, so he brought up his idea to improve on his old design and create a new wind funnel. Around the loft, they're known as The Ayr Vente. Over the year, there have been a couple different versions we tested out while hanging out and working on our boat in the harbor here and its a necessity on those variable light wind days. 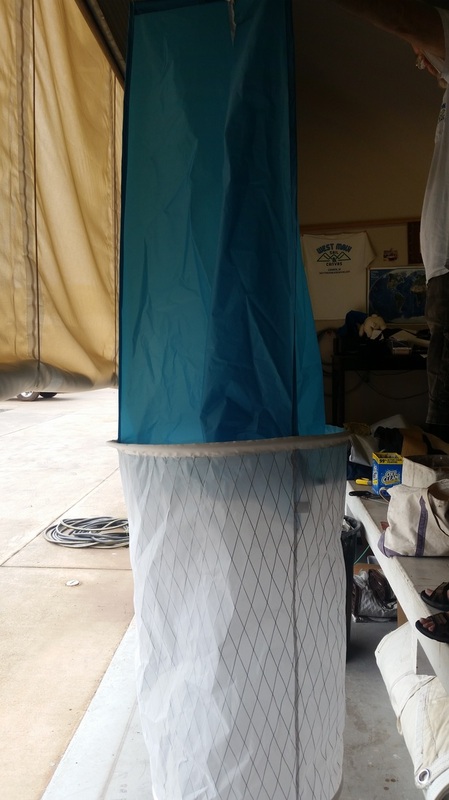 This week, my dad and crew are taking his boat, Cornelia, to Oahu for drydock and they'll be grinding away in the engine room working on various repairs, so he made a new air funnel for the trip. I'm sure it will be put to good use. In our ongoing quest to improve and extend the lifetime of sails, we've come across our own method of protecting the sails from sun damage. We repair a lot of sails that come from sailing charter companies; and while they don't see as much abuse from stress and hard sailing, sun damage is the most common killer of their sails because these boats often run 2-3 trips a day. Many times, the sail isn't fully packed away into the bag when they are between trips and they are exposed for a few hours a day. Every hour a sail is left out in direct sunlight is roughly an hour taken away from the life of the sail. We did some internet research and we asked around to some sailcloth manufacturers and we discovered that the white paint they used on UV resistant Dacron contains titanium dioxide. It is the same type of paint used to protect the wings of ultralight aircraft. It's also the same ingredient in white UV resistant latex house paint. (who would have thought?) We decided to test it out for ourselves by painting the leeches on a couple head sails as a cheaper alternative for making an entirely brand new Sunbrella cover. A can of high quality UV paint is about $40 opposed to $400 worth of Sunbrella (not including the labor cost to sew it on). It's been over two years on our first sail and its still in good condition. This week we got a brand new main sail in the loft, so we took preemptive measures and painted the head of the sail which is the part that is most exposed to sunlight. It will likely extend the overall lifetime of the sail and hopefully it will be a while before we have to see it again for repairs. Possibly the biggest and most difficult project we received came from Lanai after a high wind storm. The car wash and detailing facility in Lanai City is covered by a large vinyl tent and it had been ripped off by the wind and blown through the dirt and mud. It came to us in two pieces and we were tasked with repairing the damage and sewing the two large pieces together. In the end, the cover was about 1600 square feet (40ft x 40ft) and probably weighed around four hundred pounds. It took three people just to lift it from the truck onto the shop table where we could work on it. The entire thing was covered in red dirt mud and dust and we looked like we'd been out rolling in the dirt by the time we were done with it. It only took us a few hours and we had it finished that same afternoon so it could go back to Lanai the next morning on the ferry. I have to admit I was relieved to part with it. Although it was a difficult job for us, it would have been near impossible for anyone else to accomplish, so I'm proud to be able to do that kind of work. We have a unique workshop and a powerful machine capable of sewing through some pretty tough material, so we might be the only people around that can even take on a project as daunting as this. One of the most memorable jobs we had walk into the loft was a set of vinyl walls for some yurts deep in the valley above Waikapu. They were won in a card game and had been sitting under the previous owner's house for years most likely and they had been chewed on by rats. Our task was to patch the holes and replace the damaged screens but it was by far the dirtiest job we've had to do. Even after cleaning them, the yurt walls smelled like rat urine and mold. It was a struggle to push the large vinyl pieces through the sewing machine as well because they tended to grip and stick to the floor. by the end of the day it was a sweaty stinking mess but it was well worth it because the customer was a nice lady and it was good for a laugh. 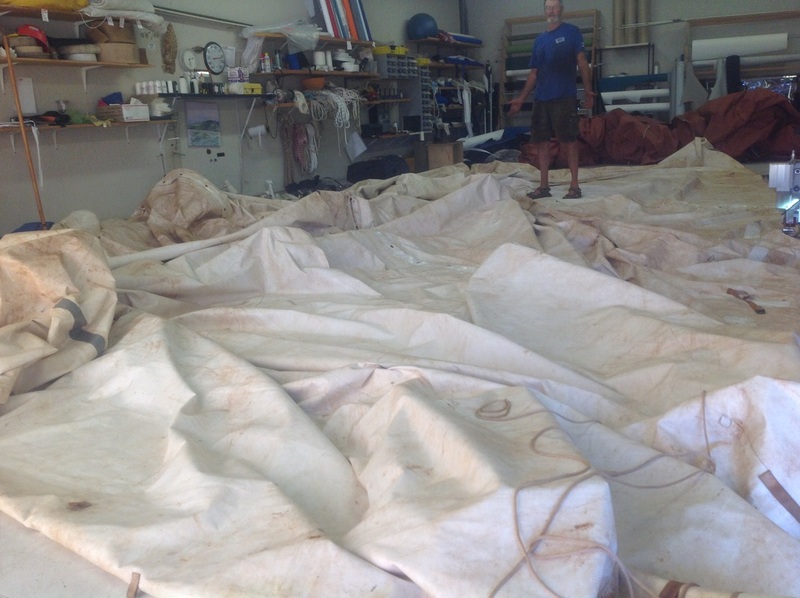 I'm the apprentice sail-maker and the son of Barry Spanier, the head sail-maker at West Maui Sail and Canvas.